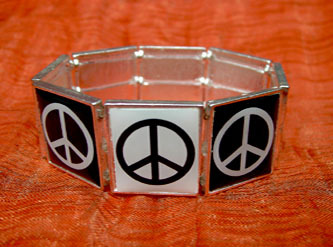 This great looking bracelet is made up of 8 alternating black and white peace sign frames, presenting a message of peace in a very cool way. The bracelet is about 7 inches around and 1 inch wide. With the peace frames connected with elastic banding, one size fits almost all. Copyright © 2013 The Peace Channel Network, Inc. All rights reserved.